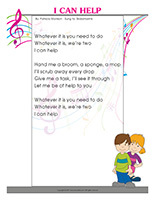 Use this theme’s activities, games, and new song to explore tasks with your little helpers. Stickers, word flashcards, a task wheel, a task chart, a positive reinforcement system, and many other documents designed to make daily tasks fun. 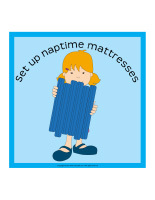 (Open thematic poster-Tasks) Print, laminate, and decorate the walls of your daycare with all kinds of posters. (Open stickers-Tasks) Print the illustrations on adhesive paper and use them to create unique stickers. (Open educa-theme-Tasks) Print and laminate the items representing the theme. Use them to present your theme and decorate your daycare. 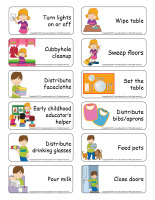 (Open educa-decorate-Tasks) Print, laminate, and cut out. Use the illustrations to decorate the walls of your daycare and set the mood for the theme. Cut out the letters required to write "TASKS" and glue them on paper plates. Hang them in the correct order to form a banner. Hang pictures or illustrations representing various tasks over your circle time area to identify children's spots. Cut pictures representing various tasks out of magazines and catalogues. Encourage children to use the pictures to create a task mural. Under each picture, write the name of the corresponding task. 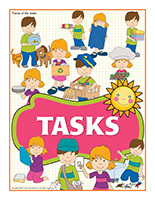 Add pictures of the children in your group under the tasks they are to complete. In the educatall club, you will find an entire section with printable documents that can help simplify your daily activities and task distribution. This tool was created in response to a special request received. (Open my weekly task chart) Print and laminate for each child. 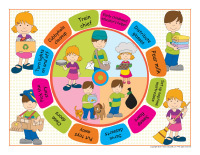 Use the chart daily to help children identify their tasks. Encourage them to check them off as they complete them. Take the time to explain the tools you have chosen to simplify your daily routine to your group. 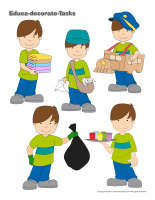 Present the different tasks and responsibilities children can participate in. (Open my task chart) Print and laminate the document for each child. Use the chart every day to help children identify their tasks. Display the charts on a wall, at children's level. Present the cards representing tasks during circle time. As a group, determine who will be responsible for each task for the day, week, or month. (Open task wheel) Print, laminate, and cut out the arrows. Make a hole in the centre of the wheel and insert a fastener to hold the arrows in place. If you wish to make the wheel sturdier, you can stick it on a paper plate. Use the task wheel during circle time. Name a child and have him spin the wheel. Ask children questions to help them recognize the illustrated tasks. The pictures may be used as a memory game or to spark a conversation with the group. Use them to decorate your daycare or a specific thematic corner. 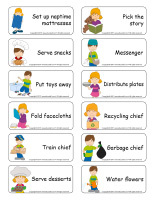 (Open picture game-Tasks) Print, laminate, and store in a Ziploc bag or in your thematic bins. (Open task ladder) Print, laminate, and hang the pictures in a column using tiny rings or pieces of ribbon or string to form a ladder representing different tasks. Write each child's name on a clothespin. Invite them to place their clothespin on the task they wish to be responsible for. Once they have completed this task, children can move their clothespin to another task. (Open picture game-Tasks) Print the illustrations twice and use them for a simple memory game. (Open word flashcards-Tasks) (Open giant word flashcards-Tasks) Print and laminate the word flashcards. Have each child pick a task and present it to the group (ex. Feed pets). Ask them questions to see what they know about the theme. Place a picture of each child in your group in a box. Use this box to determine the order in which children get to choose their task (put toys away, messenger, close doors, pick the story, turn lights on and off, distribute plates, set the table, set up naptime mattresses, train chief, serve meals, early childhood educator's helper, recycling chief, etc.). Simply pick a picture and let the corresponding child select a task. (Open the task train) Print, laminate, and cut out the various parts. Display the train in your circle time area. There are a few ways you may choose from to distribute the tasks children can complete. 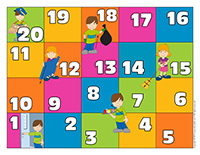 You may arrange the pictograms representing the children in your group upside down on the floor and pick one at a time, inviting the corresponding child to select the task he wishes to be responsible for. You may also choose to arrange the tasks upside down on the floor, pick one at a time, and have children raise their hand if the task interests them. Finally, you could play musical ball with the children in your group. Every time the music stops, the child who is holding the ball gets to pick his task. Name a task inspector who will be responsible for verifying if tasks were executed adequately. Change inspectors often during the day or week. Discuss with your group and try to identify a variety of tasks children can execute. Write each task on a small card and set each card in an opaque bag. You must have one bag per child. At the beginning of the week, give each child a bag and have them perform the corresponding task every day. At the end of the week, if children successfully completed their task, have them replace the task card with a plastic gem. The following week, give each child a new task. Continue this way until children's task bags are full of gems. Collect several Popsicle sticks and write a different task on each one. Set the Popsicle sticks in a box. Each morning, use the Popsicle sticks to distribute tasks by having each child pick one out of the box. Children are responsible for the corresponding task during the day. 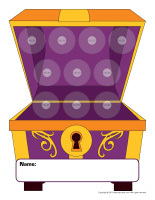 (Open positive reinforcement system-Treasure) Print so that each child has a treasure chest. Every time a child completes his daily task, he receives a coin that can be added to his treasure chest. When a child's treasure chest is full, grant him a privilege (outing, special activity, special meal, etc.). (Open responsibility chart-Tasks) Print and laminate. Display the chart where children can see it. Have each child pick a task they will be responsible for. Write the name of each child under the task they choose. With younger children, you may use pictures of the children in your group. Every day, have children pick a different task. Verify that children can execute the tasks you are offering. Congratulate children for their efforts. (Open identification-Task chief) Print the nametags on adhesive paper and laminate them. Give each child their task chief nametag. They will be happy to wear it when it's their turn to act as task chief. (Open challenge path-Tasks) Print for each child. Use this path as positive reinforcement when children complete tasks. Give children a sticker they can add to the next box on their path every time they successfully complete a task. When they reach a box containing an illustration, they have earned a small privilege or reward. When they complete the path, they get a bigger reward. You will need a large piece of cardboard. Draw a vertical line down the centre of it to divide it into two equal parts. Write "To do" on one side and "Done" on the other side. This chart will act as a task chart for your group. Write tasks that can be executed by the children in your group on clothespins. Every morning, place the clothespins that correspond to the tasks that need to be done during the day on the "To do" side. 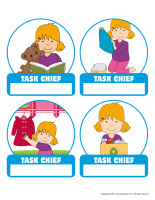 As children complete the tasks, they can move them to the "Done" side. Take pictures of the children in your group as they execute various tasks autonomously. Print the pictures and use them to create a personalized picture book for the theme. Even very young children will enjoy this activity. After lunch, set a bin on a large towel. Fill it with water and add a few drops of dishwashing liquid. Invite children to wash the plastic dishes from your kitchen area. Display laminated pictures of children participating in various simple tasks on your daycare walls. For example, you may display a picture of a child handing an early childhood educator a diaper next your changing table. You could also display a picture of a child who is setting the table in your kitchen area. Whenever a child helps you by performing a task, point to the corresponding picture. You may also point to a picture to remind a child of what he is supposed to do. When playtime is over, ask children to stop whatever it is they are doing. Count to 10. When you give the signal, they must race to put all the toys away as quickly as possible. Time them and write the result on a chart or board. Encourage them to try to beat their record the next time. Give each child a bag with handles. 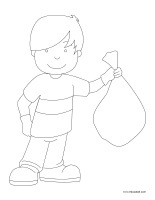 Invite children to use their bag to "collect" all the toys that are on the floor. Once this step is done, have them return the contents of their bag to the right places within your daycare. Ask children to put toys away per their color. For example, have them put all yellow toys away, then blue toys, etc. Have each child put 5 toys away, then 4 toys, and so on. You won't believe how quickly all your toys will be put away! Play a song from one of children's favorite CDs and sing along. Children must have everything put away before the end of the song. Put all the toys that need to be put away in the centre of your daycare. When you give the signal, children pick up as many toys as possible and race to put them away before running back to the pile of toys. Repeat until everything has been cleaned up. (Open die-Tasks) Print, laminate, and cut out the pictures. Wrap a cardboard box with pretty paper and stick a picture on each face. Children take turns rolling your homemade die. They must act out the task the die lands on. The other children must identify it. Print. You will need a single fishing rod for your group. Children take turns catching a fish and giving it to one of their friends. The child must place the fish in the aquarium of the corresponding color. 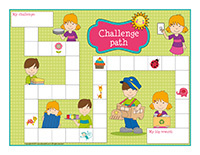 (Open snakes & ladders-Tasks) Print as many copies as necessary so that no more than three or four children are seated around each game. Give each child a playing piece. Children take turns rolling a die and moving their playing piece the corresponding number of spaces. Children stand in line behind you. They must imitate your every move. For example, if you lean to your right, the children must do the same. In the same way, if you lift your right arm up in the air, children must follow your lead. Move around the daycare this way, performing a variety of moves. Take advantage of this activity to show children the areas they may or may not visit. Children form a line and place their arms around the waist of the child in front of them to form a train. Like a train chief, announce that the train is departing. Make train sounds with your mouth. After a few minutes, stop in an area and name it. For example, you may say, "We have arrived in the kitchen." Invite everyone to explore the area for a while before riding the train to another area. (Open word flashcards-Tasks) (Open giant word flashcards-Tasks) Print two sets of word flashcards in the format you prefer. Arrange one set on the floor, in front of your group. Set the second set in a box. 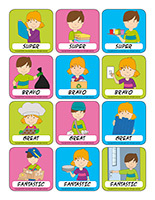 Have a child pick a flashcard and describe what he sees. When he is done, the other children must identify the corresponding task by looking at the flashcards that are on the floor. Say a series of words out loud (begin with two words and slowly increase the number of words per children's capacities). Children must repeat the words in the same order. Ideally, each word series should involve words from a specific category (example: table, utensil, plate, food, glass, etc.). 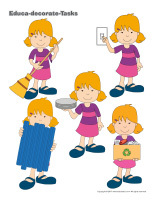 Pick a few illustrations representing different tasks. Use them to start a game. Name the first task without showing children the corresponding picture. Simply set it upside down on the table. In the same way, add a second picture. Ask children to name the tasks in order, turning the illustrations over as they name them. Once they can successfully name two tasks in the correct order, add a third task and so on. Stick small hooks on a wall, just above children's heads. Encourage them to hang items on the hooks: clothing items, small fabric bags, scarves, etc. Children will have fun hanging the items. This activity will prepare them for hanging their clothes on hooks in your cloakroom. Encourage children to participate in chores that are necessary to keep your daycare clean. This is a great way to foster autonomy while providing them with the opportunity to help you. This activity will represent a fun game for babies and toddlers. Let children draw or paint on your daycare windows using washable markers or paint. At the end of the activity, hand each child a cloth and a spray bottle filled with water. Encourage them to spray water on their artwork and wipe the windows clean with the cloths. Children quickly realize that helping others is rewarding. Show children a picture of someone who works in your daycare, the cook for example. Tell them you have a letter or item to deliver to...(cook's name). Deliver the letter or item together. You can hold a younger child in your arms. 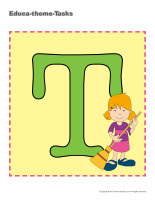 Toddlers will enjoy carrying the letter or item themselves. Hold a baby in your arms and have him turn the lights on and off for a simple game. Ask a toddler to deposit empty drinking glasses on the table at lunch time. Ask a toddler to help you get paintbrushes out of your cupboard. Pick a picture illustrating a simple task and invite children to execute it. 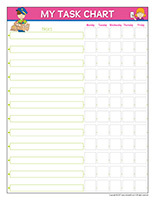 (Open coloring pages theme-Tasks) Print for each child.